Why Vertex Standard Original Parts and Accessories? For over five decades, Vertex Standard has maintained a focused commitment to delivering quality radio communications equipment that supports business productivity and public safety worldwide. We are proud to have never lost sight of this commitment and are relentless to do what it takes to continuously earn your business and achieve total customer satisfaction. A communication system is only as good as the mobile antennas used to transmit and receive – so whenever lives are on the line Vertex Standard Original accessories should be your number one choice. Choose performance-matched Vertex Standard Original audio accessories to meet your critical communication needs. Our audio accessories are built and rigorously tested to the same quality standards as Vertex Standard radios. 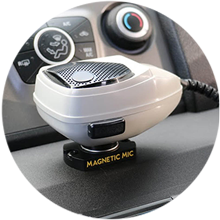 You'd be surprised how much time can be saved when each user's radio is always in the same place - made easy by the versatile selection of Vertex Standard carry accessories. Vertex Standard batteries are designed to stand up to your demanding work environment and provide reliable power that you can count on. Vertex Standard offers a variety of batteries with different chemistries to best suit your needs and help keep your radio fully functioning at all times, so you can rest assured they are ready whenever you need them. Vertex Standard chargers are designed to stand up to your demanding work environment and are available in a variety of models to help keep your radio fully functioning at all times. Vertex Standard antennas are sturdy and dependable for years of fail-safe communication. Some Vertex mobile radios' standard microphones can be upgraded to a DTMF Microphone, a Heavy Duty Microphone, or a Heavy Duty Weatherproof Noise Canceling DTMF Microphone. Turn a Vertex Standard mobile into a desktop base station. Control Station accessories make an ideal communication solution for transportation, manufacturing, and construction users. Locking Mobile Mounting Brackets and Quick Release Mobile Brackets are available for some Vertex Standard mobile radios. Some Vertex repeaters can utilize palm microphones and desktop microphones and external speakers. Rack mounting assemblies are available for some Vertex Standard repeaters. Duplexers are a primary component of most two-way radio systems, allowing a transmitter and receiver to be connected to a common antenna. Vertex has internal duplexers available for some models.